Twitter cards are special tweet types that provide extra functionality within Twitter. They allow you to gather leads directly from your Twitter feed, point people to a website, or drive traffic to an app. My favorite use of the cards is to gather email address optins (leads) directly from my Twitter feed. Successfully launching an online course, like any other product, requires marketing. One of your most powerful marketing tools is your email list. Using Twitter cards, you can create an optin in Twitter to help build your list. 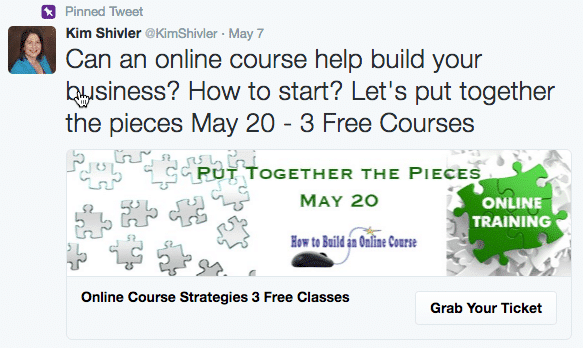 You can also use Twitter cards to advertise a specific webpage and drive traffic to your online course. The cards are found within the Twitter Ads area which is sometimes confusing, at first. You will have to configure a Twitter ads account, but don’t have to pay for advertising. You can create and post the cards for free. Twitter ads accounts are only available to established Twitter accounts. If you have created a new account, they will not be available until you fully complete your profile and have a track record of tweeting and engaging. This can take a few weeks. To access ads, select Twitter ads from your profile menu. This will walk you through several screens in order to configure your account. Note that because I had already configured my account, I was not able to go back through these screens to gather screen grabs, and because of the limitations on new accounts, creating a new ad account wasn’t an option. For the most part, the screens are simple to follow. Just understand that yes you are creating an ad account, but don’t have to actually run campaigns. You’ll have to enter your credit card to establish your account. Mine was charged $1.00, I’m guessing to test that it was legitimate. I believe this will be used toward a paid campaign, if I decide to run one. After you have configured the above information, you will be taken into the Create Campaign sequence. At this point, the menu above should have the option Creatives. This is actually where we go to create a card and finding it was the most confusing to me when I started. I am not 100% sure I had to, but based on the way the screens walked me through the process, I did end up creating a campaign. The good news is that as long as you press Save instead of Launch, it remains as a draft. Now, I just access the creatives. What I suggest is trying to access Creatives from the top menu as soon as you have entered your credit card information and been redirected to the Create a Campaign page. If it doesn’t allow this initially, go ahead and create a campaign, save it as a draft and then select Creatives > Cards from the top menu. From this point on, you’ll only need to access campaigns if you decide to pay for promoted tweets or cards. Otherwise, you’ll only need to access Creatives > Cards from the top menu. 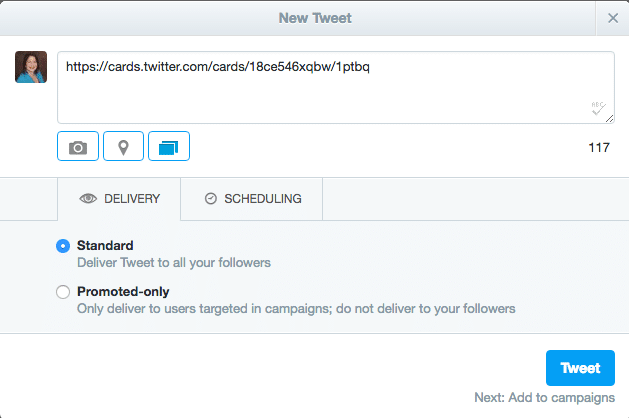 This opens the Twitter Card Manager screen where you can work with previously created cards and create new cards. Select the type of card you want to create. I’m selecting Lead Generation. Enter the Call to Action text. This will show in the button area of the card. Enter a Fallback URL. This is used if someone accesses the card from an unsupported platform and gives people a way to find more information about you. Send them to your home page or a sales page with an optin call to action. Don’t worry too much about the limitations of characters in the short description. You will have your Tweet text to call attention to the card, also. At this point, technically you can save your card and use it. See final steps, below. There are a few options that you should consider to make the card more effective. First under Destination URL Settings (optional), you can add a redirect URL, if desired. This would redirect the person to your page after they complete the optin. Alternately, you can add a text message that is displayed when they complete your optin. Personally, I prefer the text message. I save the redirect for when they confirm their subscription within their email because I use a double optin configuration. While the Data Settings section is optional, if your email management system provides a URL submit option, I highly suggest using this feature. When configured, this will add the optin emails directly to your email management provider. I use GetResponse, and it works beautifully. This feature is available for MailChimp, Aweber, ConvertKit and others. Check with your email management platform to see if you can configure a URL submit option. You’ll find information to create this URL in your email management system. If you don’t do this integration, you will need to download your optins in a CSV format which can then be imported into an email management or other system. Add a name for your card. This is used in the card management area for your reference. Check that you agree to Twitter’s policies regarding use of data. Once the card is created, you’ll need to tweet it to send it out to your followers. From the Twitter Card Manager, click on the Tweet icon next to the card you want to send. Note the link that is your actual card. You can enter your Tweet text in front of the link. If you are using campaigns, you could select Promoted-only. When sending a free card to your followers, just keep the Standard option. Click on the Tweet button, and you have just sent your first Twitter card. I recommend returning to your own Twitter profile feed and pinning it to the top. I learned this strategy from both Madalyn Sklar (@MadalynSklar) and Mike Kawula (@MikeKawula) when he was on the Twitter Smarter Podcast. To pin a tweet, select the three dots in the bottom of the tweet and select Pin to Profile Page. 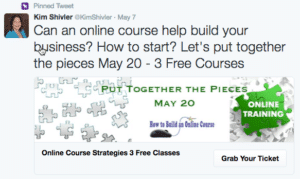 Have other questions about Twitter cards and how they can help you market your online courses? Are you already using cards to build your list? Let me know in the comments. Mike Kawula is the founder of SocialQuant.net, a company dedicated to helping you build a Twitter audience. Thank you Madalyn Sklar for much of this information. I attended Madalyn’s Twitter card presentation at Social Media Marketing World. You can learn more about Twitter marketing at http://www.madalynsklar.com/. Join in for her #TwitterSmarter Twitter chat Thursdays at 1:00 PM ET. Thanks for a great article – some good practical tips here.